Route 7 runs from Hamilton to Royal Naval Dockyard (Kings Wharf/Heritage Wharf) and is arguably the most picturesque bus route in Bermuda. 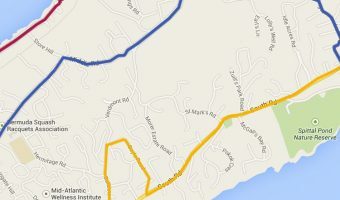 Route 8 also goes between Hamilton and Dockyard but takes a less interesting route along Middle Road. The bus leaves the Central Terminal in Hamilton and travels along East Broadway, passing the Bermuda Underwater Exploration Institute. It then goes into Paget Parish, stopping at the King Edward VII Memorial Hospital and the Botanical Gardens (Masterworks Museum of Bermuda Art and Camden). It then follows the South Road, a beautiful coastal route along the southern shore of the island. Places of interest include Elbow Beach, the Elbow Beach Hotel, Astwood Park, Warwick Long Bay, Jobson’s Cove, Chaplin Bay, Horseshoe Bay, the Fairmont Southampton, Gibbs Hill Lighthouse, and Church Bay. The bus then joins Middle Road and takes the same route as bus number 8 to Dockyard, passing through Southampton and Sandys. Attractions and hotels on this stretch of the route include the Port Royal Golf Course, the Pompano Beach Club, Hog Bay Park, Somerset Bridge, Fort Scaur, Somerset Long Bay, and Cambridge Beaches. The final destination is Royal Naval Dockyard. The former naval base is home to Bermuda’s largest cruise ship terminals (Kings Wharf and Heritage Wharf) plus plenty of attractions such Bermuda Fun Golf, the Bermuda Arts Centre, the National Museum of Bermuda, Dolphin Quest, Snorkel Park Beach, and the Neptune Cinema. The area also boasts a number of retail outlets (Clocktower Mall, Dockyard Pharmacy, Dockyard Glassworks, and the Bermuda Rum Cake Company) and places to eat and drink (Bone Fish Bar and Grill, Café Amici, the Freeport Seafood Restaurant, and the Frog & Onion). The complete trip from Hamilton to Dockyard takes around one hour. The first bus departs from Hamilton at 7 am with services running approximately every 15 minutes. It should be noted that some buses on this route only go as far as Barnes Corner in Southampton Parish. Check the sign on the front of the bus or the official schedule for clarification. There’s also a ferry service between Hamilton and Dockyard. Many visitors chose to do one leg of the journey on the bus and return on the ferry. If you’ve bought a transportation pass it’s valid for both modes of travel. The map below shows the route taken by buses on Route 7. Click here for an interactive map showing points of interest and more. Horseshoe Bay is regarded by many as the best beach in Bermuda. It’s certainly the most popular. Our guide includes a video, photos, chair and umbrella rental prices, details of how to get there, and a map. There are 11 bus routes in Bermuda, covering all areas of the island. See detailed route maps, schedules, journey times, and more. Bus fares in Bermuda are pretty cheap. You can pay in cash on the bus, or save even more money by buying a transportation pass, tokens, or a book of tickets. Simplified bus timetable showing frequency, plus start and finish times for all services. The longest beach on the island stretches for more than half a mile. It’s extraordinarily beautiful, but rarely crowded.